The first and only strike to make headlines in the Chinese press began on May 17th and lasted until June 4th. It took place at Honda’s Nanhai factory in Foshan, Guangdong. The strike was kicked off by two workers from the factory’s assembly division. Well aware of their central position within the production line, these two young workers were quickly joined by the rest of the assembly division and were able to suspend production throughout almost the entire factory.1 Their actions sparked over two weeks of protest which at its height gained the support of some 1,900 workers. The strike eventually stopped production at four Honda assembly plants and went on to inspire at least eleven large-scale strikes in other foreign-owned auto factories.2 Was this strike wave the result of mere spontaneity? Why were the strikes so ubiquitous in the auto industry? And why did they take place in mostly Japanese-owned (or Japanese-invested) factories? While the recent strikes are clearly not without precedent, the amount of attention and support from the media went well beyond established protocol. The Nanhai strike began receiving coverage in the Chinese press within the first week of its appearance. Because Nanhai is a transmissions plant, the strike caused production to come to a halt at three assembly plants in Guangzhou on the 25th and one in Wuhan on the 27th. Following the suspension of production at these other Honda factories the Western media began to take notice. The Ministry of Propaganda then issued instructions to pull coverage of the strike on May 28th.8 In spite of this, the local Guangdong media continued to cover the strike up until its conclusion. On May 31st, after 200 thugs affiliated with the local trade union physically assaulted a group of workers, the Nanhai strike turned into a national incident. Letters from the trade union, sympathetic academics, and the striking workers themselves were all published in the mainland press. Meanwhile, all this was transpiring within a climate of outrage over the treatment of workers at Foxconn Technology (a Taiwanese-owned electronics manufacturer with operations in Shenzhen). The Chinese media thus played a key role in presenting the Nanhai strike as not only erupting without precedent but more importantly as a heroic struggle by migrant workers for just compensation and respect. The fact that this was allowed to take place at all reflects a tacit approval by the Central Government in favor of the worker’s demands. In short, it was not so much the Nanhai Honda strike itself but the degree of publicity and support the strike received in the Chinese media that made it truly remarkable. This is important to note because it was precisely this publicity that lent confidence to other workers in the auto industry and throughout the country at large. Honda’s decision to raise the wages of Nanhai employees by ¥500 per month (around a 33% increase) and the publication of this information in various Guangdong newspapers established a standard by which other Honda workers could measure their own grievances. The proximity of auto parts factories in the Pearl River Delta allows for word of mouth to function as a rudimentary form of communication between enterprises. As a result, copycat strikes erupted throughout the industry. Although the Chinese press was ordered to stop reporting subsequent strikes, Hong Kong and Western media were able to provide information on these strikes for the various Chinese internet forums which sprang up in response to the struggle. In this way, labor unrest was able to spread to at least eleven other factories in the auto industry. From June 9th to June 18th, Honda Lock workers in Xiaolan went on strike in defiance of management. Like Nanhai Honda, Honda Lock was one of the few strikes where workers demanded the reelection of union officials. Unlike the Nanhai strike however, management decided to take a hard-line stance and workers were forced to retreat from many of their original demands. After six days of struggle and three days of waiting,9 workers at Honda Lock finally settled for a meager ¥200 pay increase and an ¥80 housing subsidy per month. This puts Honda Lock on a par with only the Toyota Gosei strike in Tianjin in the minimal amount of concessions won. The strike was described to me rather candidly by one worker as “a failure.” Demands for union reelections were never seriously addressed, as they were at Nanhai. Instead, workers were told that “the company has no authority over such matters.” This seems incredibly two-faced being that Honda Lock is a joint venture with thirty percent ownership held by the Xiaolan government! On the other hand, that is precisely why the strike had so much difficulty succeeding. Such attempts to voice more overt political demands are in need of some clarification. As far as we know, calls to restructure enterprise-level unions were put forth at Nanhai Honda, Honda Lock, and Denso. However, this was misinterpreted by many foreign journalists as calls for fully independent unions. There is an important distinction here. The only legal union in China is the All China Federation of Trade Unions (ACFTU). Though nominally an independent union, in reality the ACFTU acts as a quasi-governmental organization. Enterprise-level unions are very often chaired by CCP cadre and (or) management. However, the right of workers to reelect enterprise union officials is protected under Chinese labor law. As Anita Chan pointed out in her article on the strikes, there is a significant difference between demanding a restructuring of the factory union and the right to establish a union independent of the ACFTU.10 Workers who expressed this demand therefore were acting within the purview of their legal rights. Unfortunately, such demands constitute much less of a political challenge than what was presented in the foreign press. Another area in need of clarification is the question of why the strike wave was largely confined to Japanese-owned enterprises. Though some commentators speculated that this was related to some lingering resentment toward the Japanese,11 in actuality the strikes had nothing to do with nationalism. A better explanation is that auto industry workers simply became more aware of their bargaining power as a result of the victory at Nanhai. This then emboldened workers affiliated with Honda to push for similar demands. Finally, Japanese lean production techniques certainly played a role in the ability of workers to force demands on management.12 Lean production is a cost-cutting strategy based primarily on just-in-time delivery of parts and the subcontracting of low-tiered workers. An assembly worker I spoke with from the Nanhai Honda factory was very conscious of not only the importance of factory interns in saving labor costs to the company but also the pivotal role of his assembly division within production. “The whole factory looked to us for leadership; cause when we stop, they stop,” he recalled. Though workers seemed unaware that lean production techniques are a trade mark of the Japanese auto industry, some obviously understand that certain ways of organizing production are more vulnerable to disruption than others. This knowledge no doubt strengthened workers’ confidence in their own bargaining power and may be another reason why so many Japanese auto parts factories were targeted. On the whole, the strike wave of May, June, and July was an overwhelming success. Despite minimal concessions awarded to Honda Lock and Toyota Gosei, all other factories for which there is information won considerable pay increases. Not only that but pay increases increasingly rose from the ¥500 won at Nanhai Honda, to the ¥800-¥900 won at Denso, to the high of ¥980-¥1420 awarded to Atsumitec workers. Although demands to restructure factory unions largely fell on deaf ears, workers from Nanhai Honda went ahead with reelections of their union chairman on September 1st.13 In addition, the strikes seem to have given those in favor of union reform the upper hand in Guangdong province.14 While the latter may mean little to rank-and-file workers, it is a testament to the threat autonomous worker’s struggles—particularly those within the auto industry—present to the stability of the “communist” regime. Honda moved production to China in 1992. It began as a joint venture in cooperation with the state-owned enterprise Dongfeng Motor. Though initially involved in making motorcycle parts, Honda eventually turned its focus to auto parts production and assembly. As part of China’s attempt to protect domestic industries, the government requires foreign firms investing in the auto assembly sector to establish 50-50 joint ventures with Chinese firms. This however does not apply to firms involved in component parts production.15 Over time, this led to a situation where Honda shifted a huge percentage of its auto parts production to China and to Guangdong province in particular. Though now promoted as a profit maximizing strategy, Honda today has the highest percentage of core parts coming from locally sourced suppliers—many of them Honda subsidiaries—of any foreign automobile enterprise operating in China.16 Having so many factories concentrated in one region needless to say makes Honda more vulnerable to large-scale industrial unrest. This may be another reason why strikes in Honda factories were so pervasive. Both the local sourcing of component parts and JIT delivery systems are integral to the Japanese auto industry’s strategy of increasing output while keeping down labor costs. These are known as “lean production techniques.” As mentioned earlier, an important aspect of lean production is the subcontracting of workers from lower tiers of production. This means separating the workforce into essentially two groups—skilled and well paid core workers on the one hand and unskilled, underpaid, and temporary base laborers on the other. In China, this strategy was broadly adopted within the auto industry during the late 1980s and early 1990s.17 Although designed to improve flexibility without laying off elderly workers, this subcontracting system creates a hierarchy of labor which is incredibly effective at undermining worker’s solidarity. 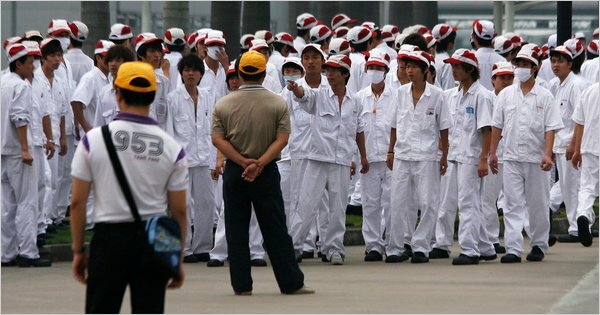 During the Nanhai strike, Honda management made repeated attempts to divide interns from formal workers by appealing to the acute grievances of the interns. At one point students from the interns’ schools were even sent to the factory to convince interns, who constituted one third of the workforce, to settle for management’s offer.18 Fortunately, at Nanhai such attempts were unsuccessful. According to some analysts, a tiered labor system within the Japanese auto industry in China is becoming increasingly harder to maintain.19 In order to sustain current rates of productivity, firms are being forced to cut into the relative security of core workers, pushing them into the lower tiers and deskilling them in the process. While this obviously lessens the bargaining power of labor within the market, it also helps to dismantle workforce hierarchies and therefore should increase worker solidarity. This trend may have been in evidence at Honda Lock where workers were primarily unskilled. On the one hand, Honda Lock was very effective in taking a hard-line position against employees seen as replaceable. On the other hand, workers showed a fair degree of solidarity and were infuriated by management’s repeated attempts to hire strike breakers and force workers to chose between a pitiful ¥100 wage increase or being fired. Although the central concern of the strikes was to secure higher wages and bonuses, Chinese autoworkers—and assembly workers in particular—are generally paid a reasonable wage. Working conditions in auto assembly plants are also decent, though this is less true of component parts factories. In recent years however autoworker salaries have slightly decreased while wages in other manufacturing sectors have increased.20 This seems to suggest that the strike wave had more to do with maintaining respectable wages relative to other industries than to material want in an absolute sense. With that being said, it is important to note that only one of the factories that went on strike was an assembly plant,21 all other factories were component parts suppliers and affiliates. This would suggest that grievances among workers from auto parts factories—where work is likely to be less skilled, less well paid, and conditions less satisfactory—are generally greater than those of workers from assembly plants. While Honda and Toyota suffered tremendous profit losses thanks to the strikes, in this instance Chinese autoworker demands for increased wages inadvertently converged with the aims of the central government. The CCP’s 12th Fifth Year Plan (2011-2015), scheduled to be passed this fall, recognizes the importance of raising wages as a share of GDP. If China’s economy continues to grow at current levels of investment, her production capacity will eventually outstrip global demand. Thus, it is necessary for China to move from an export driven economy to a more balanced model based on greater domestic consumption. Wages will play a key role in helping to increase this consumption. Following the resolution of the Nanhai strike, both the Shenzhen government and the Beijing Municipal Government announced they were raising local minimum wage by ten percent and twenty percent respectively.22 Since January of this year, over half of China’s provinces have declared similar increases in the minimum wage. Thus, while workers were in no way manipulated by the CCP to go on strike, their calls for partaking in a greater share of the wealth were no doubt met with sympathy by certain factions within the government. The Chinese economy is fueled by the sweat of cheap migrant labor. These laborers are generally born and raised in the countryside where income from agriculture can barely support a family. As a result, they move to the cities to look for work. However, as formal residents of the countryside they cannot enjoy the social welfare benefits awarded to urban residents. They are thus effectively an underclass and are often treated as such by people from the city. Migrant workers in China currently number over 210 million.23 Statistics from 2005 indicate that migrant labor comprised 57.5 percent of the Chinese industrial sector and 37 percent of the service sector for that year.24In the Pearl River Delta however this percentage is much higher. Migrants in the Pearl River Delta divide into roughly three categories. Around ten percent are actually urban workers, often former employees of the State Owned Enterprises. These migrants tend to be older, skilled workers and have usually received a decent education. The other ninety percent of migrant workers are from the countryside—thirty percent being farmers and sixty percent being former students. It is often suggested that because migrant workers from the countryside own farmland and plan to return to it in the future they are less likely to get involved in serious and protracted labor disputes in the cities. While this generalization may be true of older migrant workers who know how to farm, it is certainly not the case with former students from the countryside. Young workers, fresh out of high school and vocational college, form the majority of migrants in the Pearl River Delta. These workers not only lack the skills to engage in agriculture, but are often unable to be supported by the family farm. In addition, they see a farmer’s life as a considerable step backward in light of the education they have received. Former student workers thus form a peculiar group whose long-term interests are bound to the city yet who are unable to obtain the social benefits of urban residents.25 It was precisely this group of workers that showed its teeth so ferociously during the strike wave. In many ways Mr. Chen26 is not typical of the majority of workers at Honda Lock. Though he grew up in the Hunan countryside, Mr. Chen had been working in the Pearl River Delta since 1992. He was older than most of his coworkers, having already married and had kids. Prior to quitting his job, he had been employed in the paint division at Honda Lock. As a skilled worker, Mr. Chen enjoyed considerable respect within the factory. He received decent pay and was well treated. Because of the respect shown him, when the strike broke out he was chosen to represent his division in negotiations. This however caused problems for him almost immediately, as he now became identified as a “leader.” His phone was tapped and management tried on several occasions to either intimidate him or buy him off. Fed up with negotiations and fearing for his safety, Mr. Chen resigned from of his position at Honda and moved his wife and kids to a different town. Over the past few years, the ACFTU has begun shifting its focus from enterprise-level negotiation and arbitration to industry-wide negotiations.28 The recent strike wave has only helped this process further along and it is pushing other changes onto the agenda as well. Proposals to make enterprise unions less financially dependent on employers have been heard coming from several quarters. In addition, there has been discussion of strengthening democratic management of enterprises and in Guangdong even reinstating legal protections for striking workers.29 While this may represent an important break through in reforming the ACFTU, in the long run it will lead only to co-optation and the further stabilization of capital. A true labor movement will be built on the trial and error of the worker’s themselves or it will not be built at all. Let us hope that the recent strikes have served as a process of politicization that will help sow the seeds of a future workers movement. total of around 1,500 workers employed;39 peak of 1,700 on strike (discrepancy in statistics);40 unskilled, low education, 1/2 women, no dormitories. 1. “Nanhai bentian fugong, gongren qude jubuxing shengli” (Nanhai Honda Returns to Work, Workers Win a Partial Victory), Chinanews. June 2, 2010. 2. At least a dozen strikes were reported to have taken place within the auto industry between May and July, though it is highly likely that many more occurred—both inside and outside the auto industry—than were reported. See the timeline below. 3. International Trade Union Confederation/Global Union Federation. 4. IHLO, “A Political Economic Analysis of the Strike in Honda and the Auto Parts Industry in China.” at IHLO.org. July, 2010, pp. 19-20. 5. Ching Kwan Lee, Against the Law: Labor Protests in China’s Rustbelt and Sunbelt. University of California Press, 2007, p. 5. 7. Report of Chinese Labor Science Studies, 1997-1999Against the Law: Labor Protests in China’s Rustbelt and Sunbelt. University Of California Press, 2007, P. 174. 8. Fiona Tam, Mimi Lau, “Shutters Slammed on Reporting of Strikes,” South China Morning Post. June 12, 2010. 9. Many workers agreed to return to work on June 15th while negotiations dragged on until the evening of June 18th. 10. Anita Chan, “Labor Unrest and the Role of Unions,” China Daily. June 18, 2010. 12. For a discussion of lean production techniques see: Beverly Silver, Forces of Labor: Workers’ Movements and Globalization since 1870. Cambridge University Press, 2003, pp. 66-74. 13. This information was verified by a worker from Nanhai Honda. 14. Luisa Tam, “Guangdong Blazes Path on Collective Bargaining,” South China Morning Post, July 27, 2010. 15. IHLO, “A Political Economic Analysis of the Strike in Honda and the Auto Parts Industry in China.” at IHLO.org. July, 2010, p. 4. In addition, China requires that forty percent of auto parts used by assembly factories (which are necessarily joint ventures) be produced locally, by either foreign or domestic firms.Ibid., p. 3. 21. See the timeline below for the fifth Honda strike. 22. David Barboza, “More Honda Labor Trouble in China,” New York Times. June 9, 2010. 23. Xinhua News Agency, “China’s ‘Floating Population’ Exceeds 210m,” China Daily, June 27, 2010. 24. Ching Kwan Lee, Against the Law: Labor Protests in China’s Rustbelt and Sunbelt. University of California Press, 2007, p. 6. 25. This information comes from a discussion the author had with the Shenzhen labor NGO Honghuacao. 26. Although the interviewee no longer works for Honda Lock and was not overly concerned with protecting his anonymity, I have nevertheless chosen to refer to him by the pseudonym Mr. Chen. 27. This is of course true throughout much of the world and is by no means peculiar to China. 29. “ACFTU Pushes Forward on Collective Bargaining and Democratic Management,” International Law Office, September 8, 2010. 30. Wang Duan, “Bentian zai zhongguo si jia zuzhuangchang tingchan” (Four Honda Assembly Plants in China Stop Production), at Caixin Online. May 28, 2010. 31. David Barboza, “Workers in China Accept Deal, Honda says,” New York Times. June 4, 2010. 32. “Nanhai bentian fugong, gongren qude jubuxing shengli” (Nanhai Honda Returns to Work, Workers Win a Partial Victory), Chinanews. June 2, 2010. 34. “Bentian ti di san fen tiaoxin fang’an, gongren jixu tinggong” (Honda Presents a Third Wage Adjustment Offer, Workers Continue to Strike), Southern Weekly. May 31, 2010. 35. David Barboza, “Workers in China Accept Deal, Honda Says,” New York Times. June, 4 2010. 36. Will Clem, Mimi Lau, Choi Chi-yuk, “Hundreds Clash as Labour Strife Widens: Worker Unrest Spreads to Yangtze River Delta,” South China Morning Post. June 9, 2010. 37. Tom Mitchell, Justine Lau, Robin Kwong, “Protests Pose Challenge for Beijing,” Financial Times. June 9, 2010. 38. Will Clem, Mimi Lau, Choi Chi-yuk, “Hundreds Clash as Labour Strife Widens: Worker Unrest Spreads to Yangtze River Delta,” South China Morning Post. June 9, 2010. 39. Mimi Lau, “Honda Hit by Strike at Third Factory, More Industrial Action as Earlier Dispute Ends,” South China Morning Post. June 10, 2010. 40. Keith Bradsher, “Workers at Chinese Honda Plant March in Protest,” New York Times. June 10, 2010. 41. Mimi Lau, “Honda Hit by Strike at Third Factory, More Industrial Action as Earlier Dispute Ends,” South China Morning Post. June 10, 2010. 42. Keith Bradsher, “Workers at Chinese Honda Plant March in Protest,” New York Times. June 10, 2010. 44. Choi Chi-yuk, “Hundreds Hold Out for Better Pay at Honda, Some Staff Make Concessions and Return to Work,” South China Morning Post. June 15, 2010. 45. Mimi Lau, “Honda Hit by Strike at Third Factory, More Industrial Action as Earlier Dispute Ends,” South China Morning Post. June 10, 2010. 46. Ng Tze-wei, Choi Chi-yuk, Verna Yu, “Toyota Hit Again As Pay Claims Escalate, Strikes a Release of Pent-up Demand,” South China Morning Post. June 19, 2010. 50. John Chan, “More Strikes Erupt in China’s Auto Industry,” World Socialist Website. June 21, 2010. 51. Reuters, “Second Strike Hits Toyota Supplier,” South China Morning Post. June 18, 2010; Associated Press, “Toyota is Latest Car Maker Hit by Strike in China,” New York Times. June 17, 2010; “Strikers Seal Deal at Toyota to Resume Work After Pay Hike,” China Daily. June 21, 2010. 52. Li Fangfang, “Strike at Toyota Parts Supplier Ends Quickly,” at China Daily. June 18, 2010. 53. Associated Press, “Toyota is Latest Car Maker Hit by Strike in China,” New York Times. June 17, 2010. 54. “Strikers Seal Deal at Toyota to Resume Work After Pay Hike,” China Daily. June 21, 2010. 58. Hiroko Tabuchi, “Walkout Closes Another Toyota Supplier in China,” New York Times. June 18, 2010. 59. “Strikers Seal Deal at Toyota to Resume Work After Pay Hike,” China Daily. June 21, 2010. 61. Reuters, “New Strike at Supplier to Toyota, Honda,” South China Morning Post. June 22, 2010. 62. Peter Symonds, “More Strikes Hit Auto Plants in China,” World Socialist Website. June 26, 2010. 63. Reuters, “New Strike at Supplier to Toyota, Honda,” South China Morning Post. June 22, 2010. 64. Mimi Lau, “Toyota Production Hit by Supplier’s Strike, Workers Down Tools at Plant that Makes Fuel Injection Equipment and Demand Pay Rise,” South China Morning Post. June 23, 2010; Mimi Lau, “More Car Parts Workers Walk Off the Job, A Japanese-owned Component Plant in Guangzhou is the Latest to be Hit by Strike Action,” South China Morning Post. June 24, 2010. 65. Hiroko Tabuchi, “With Strike, Toyota Idles Auto Plant in China,” New York Times. June 22, 2010; Mimi Lau, “Toyota Production Hit by Supplier’s Strike, Workers Down Tools at Plant that Makes Fuel Injection Equipment and Demand Pay Rise,” South China Morning Post. June 23, 2010; Mimi Lau, “More Car Parts Workers Walk Off the Job, A Japanese-owned Component Plant in Guangzhou is the Latest to be Hit by Strike Action,” South China Morning Post. June 24, 2010. 66. Reuters, “Labour Strife Halts Toyota, Honda Plants,” South China Morning Post. June 23, 2010. 67. Mimi Lau, “More Car Parts Workers Walk Off the Job, A Japanese-owned Component Plant in Guangzhou is the Latest to be Hit by Strike Action,” South China Morning Post. June 24, 2010. 68. Peter Symonds, “More Strikes Hit Auto Plants in China,” World Socialist Website. June 26, 2010. 69. Reuters, “Labour Strife Halts Toyota, Honda Plants,” South China Morning Post. June 23, 2010. 70. Agencies, “End in Sight for Toyota Strike, Unrest at Nissan,” South China Morning Post. June 25, 2010. 71. Reuters, “Labour Strife Halts Toyota, Honda Plants,” South China Morning Post. June 23, 2010; Mimi Lau, “More Car Parts Workers Walk Off the Job, A Japanese-owned Component Plant in Guangzhou is the Latest to be Hit by pager Strike Action,” South China Morning Post. June 24, 2010. 72. Agencies, “End in Sight for Toyota Strike, Unrest at Nissan,” South China Morning Post. June 25, 2010. 73. Mimi Lau, “More Car Parts Workers Walk Off the Job, A Japanese-owned Component Plant in Guangzhou is the Latest to be Hit by Strike Action,” South China Morning Post. June 24, 2010. 74. Reuters, “Honda Plant Halted Over Labour Strife,” South China Morning Post. July 09, 2010; “Honda Assembly Plant Resumes Production After Two-day Strike,” South China Morning Post. July 10, 2010. 75. Reuters, “Honda Strike Ends After 45pc Pay Rise,” South China Morning Post. July 22, 2010. 76. Reuters, “Striking Foshan Workers Demand Apology,” South China Morning Post. July 16, 2010. 77. Reuters, “New Strike Hits Honda Parts Supplier,” South China Morning Post. July 15, 2010; Mimi Lau, “Foshan Factory Strike Enters Fourth Day,” South China Morning Post. July 16, 2010. 78. Mimi Lau, “Foshan Factory Strike Enters Fourth Day,” South China Morning Post. July 16, 2010. 79. Reuters, “Striking Foshan Workers Demand Apology,” South China Morning Post. July 16, 2010. 81. Mimi Lau, “Foshan Factory Strike Enters Fourth Day,” South China Morning Post. July 16, 2010. 82. Reuters, “Honda Strike Ends After 45pc Pay Rise,” South China Morning Post. July 22, 2010. 83. Reuters, “Omron Workers Down Tools for Better Pay,” South China Morning Post. July 22, 2010. 84. Reuters, “New Strike Hits Guangdong Factory,” South China Morning Post. July 21, 2010.